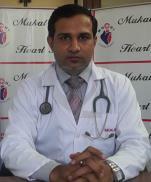 Dr. (Maj.) Rajeev Gupta, MBBS, MD (Internal Medicine) is a Physician & Intensivist at Mukat Hospital, Chandigarh. Dr. (Maj.) Gupta is an alumnus of Indira Gandhi Medical College, Shimla, from where he has attained his undergraduate degree in the year 2001. With the passion of serving the society, he served in the rural area & later joined the Indian Army Medical Corps. During his tenure as an Army Officer, he got an opportunity to serve in Siachen Glacier & Dras sub sector, which is the world’s second most coldest inhabitation place. After gaining experience in such a wide array of human diseases, he went on to pursue with his post graduation in Internal Medicine from INH Ashwani, Mumbai. During his academic years, he got an opportunity to manage few challenging cases like electrical storm & Eosinophilic Gastroenteritis, under the guidance of experienced faculty over there, which he later published in the national level journal. Dr. (Maj.) Gupta is a member of various professional associations and has numerous poster & paper presentations in his name.